The company is announcing Microsoft Classroom, a hub built on top of the Web-based Office 365 and designed to help teachers manage documents, calendars and assignments. It’s scheduled to arrive this summer. Microsoft is ramping up its effort to compete with Google and Apple in the classroom, offering a slate of applications designed to make it easier for teachers and students to use the company’s products. The Redmond company is announcing Thursday that Microsoft Classroom, a hub built on top of the company’s Web-based Office 365 suite for teachers and students to manage documents, calendars and assignments among classes, will arrive later this summer. Separate tools being built into the Windows 10 operating system, and set for release alongside a broader update this summer, are designed to let teachers quickly set up computers for students and, during tests and quizzes, lock down devices so students can’t leave the quiz window to search the Web for the right answer. The announcements come a month after Apple introduced its own classroom hub for iPads. Google has offered a similar, Internet-based service since 2014. Education is a crucial battleground for technology companies. Software and devices people become familiar with as children tend to stick around into adulthood. 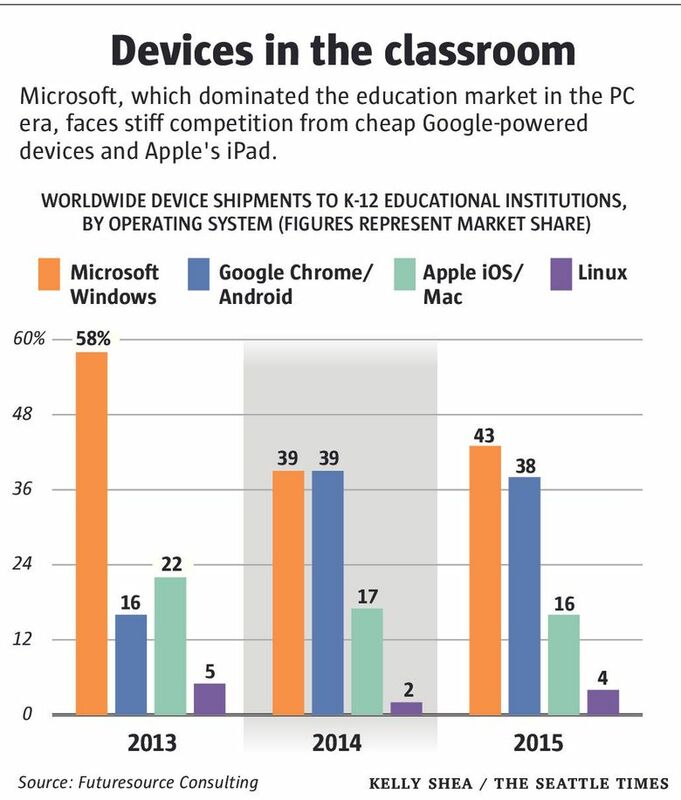 The prominence of Apple and Google in the classroom, along with a set of free-to-use word processing and note-taking tools, threaten to make the current generation of students far less familiar with Microsoft’s products than the Windows PC-focused cohort that came before. Microsoft still leads globally in powering the devices making their way to schools. Windows ran 43 percent of the devices sent to K-12 classrooms last year, up from 39 percent a year earlier, according to Futuresource Consulting. Google was second in 2015, at 38 percent, with Apple at 16 percent. But Microsoft is on the defensive, particularly in the U.S., where Google has made deep inroads with its low-cost Chromebook laptops. Google devices accounted for 52 percent of U.S. education-device shipments last year. Apple products totaled 25 percent. Windows was third, at 22 percent. “The rise of Chromebooks in the U.S. market has been unprecedented,” Phil Maddocks, an analyst with Futuresource, said in a report last month. Microsoft has tried to counter that, working with PC makers to roll out cheaper Windows devices. “We feel great about our competitive position,” Tony Prophet, a corporate vice president leading Microsoft’s education marketing, said in an interview. “We’re deepening our investment and focus.” Hundreds of Microsoft software engineers are working solely on education-focused projects, he said. Prophet also highlighted “Minecraft,” a wild card he said is working in Microsoft’s favor. Microsoft acquired the studio behind the wildly popular world-building online game in a $2.5 billion deal in 2014, giving the company a brand popular with the school-age set. Microsoft in January bought the separate MinecraftEdu, a version of the game aimed at teaching skills like problem solving, computational thinking and collaboration. The preview version of that program will get a wider trial with some teachers and students beginning in June, Microsoft said Thursday.